Today we are interviewing Ellard L. Thomas, author of the personal development book Moving Forward, Courageously | Seven Secrets to Restoring Love, Money and Happiness in Your Life. For nearly two decades, I have helped professionals, educators and adult students to overcome their personal and professional challenges. Due to the impact that I have made in their lives, I have earned the title of "America's Break Your Barrier" expert. I truly enjoy helping people to reach the next level of their lives. 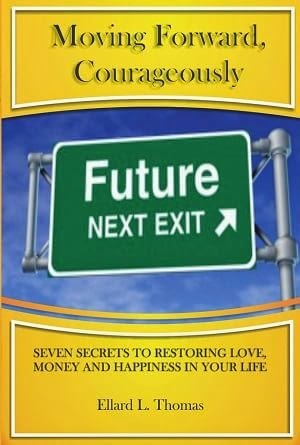 Moving Forward, Courageously reveals a seven-step plan designed to help people with rebuilding their lives after facing heartache, financial loss, the death of a loved one and several other common adversities. People must understand that they are far more powerful than the challenges they face. Individuals who would most appreciate Moving Forward, Courageously are individuals who seek to restore love, money and happiness in their lives following life's challenging or tragic events. What inspired you to write a book about overcoming challenges? Considering the hurt, abuse, failed businesses and other hardships I had undergone, I realized that countless others experienced similar afflictions. Sadly there weren't any books which revealed an easy-to-follow system to help them get back to living. From this revelation, Moving Forward, Courageously was birthed. One of my clients called it "a necessity during adverse conditions." One of the themes in your book is that adversity offers opportunity. Can you elaborate on this a bit? Within each of us lies a greater being. Unfortunately, this greater self is awakened only through adversity. Following in-depth studies of great people I've concluded that "The seeds of greatness are often watered by the rains of adversity and affliction. " Some of the world's greatest achievements were spawned from adversity. Reading Moving Forward, Courageously will enable and empower readers to rebuild their lives. Many people struggle with overcoming hurt and loss and have a hard time returning to living with joy and happiness. This book helps them to find their way back to the life they deserve. Outside of writing, what other endeavors are you involved with? Good question. Outside of writing, my other endeavors include speaking and training, working in ministry, advocating for the youth and helping individuals with becoming entrepreneurs. My greatest endeavors are being a great father and husband. I am happy to announce my next project: Defeating Goliath. Focusing on the epic battle between David and Goliath, this book reveals how readers can unlock their inner warrior to defeat any obstacle that stands between them and their individual definition of success and their purpose. I am truly excited about it. Yes. Moving Forward, Courageously was written specifically for readers that need a systematic way of breaking their financial, spiritual, personal or professional barriers. It refrains from insulting readers' intelligence by not having rehashed or redundant "How to" information that's commonly found in other self-help or personal development books. If you struggle with overcoming hardships, or know someone else who is, make Moving Forward, Courageously a part of your life-restoration plan.